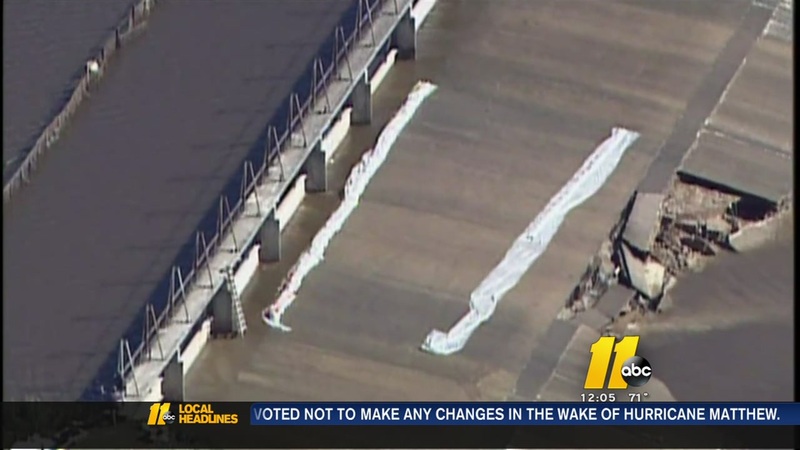 MOORE COUNTY, N.C. (WTVD) -- The Woodlake Dam, which was damaged during Hurricane Matthew, will have to be intentionally breached so all the water can be drained out officials told ABC11 Monday. The I-Team has been investigating the private dam and the state says they have told the owners what must be done due to lingering concerns that the dam could fail. The dam sprang a leak during the hurricane. They've been slowly pumping out the water since the flooding. At one point, workers tried to shore up the dam with sandbags. Engineers expect the lake to be drained by the end of the week. The state says the owner has until Friday to come up with a temporary breach plan and until Nov. 4 for a final plan. Dozens of residents were forced to evacuate their homes when the dam was damaged. Some people told ABC11 there's talk of some people planning to move permanently. Others said they are contemplating joining a possible lawsuit against the other. Residents say the dam has been a problem for years. Read more about the damage to the dam here.